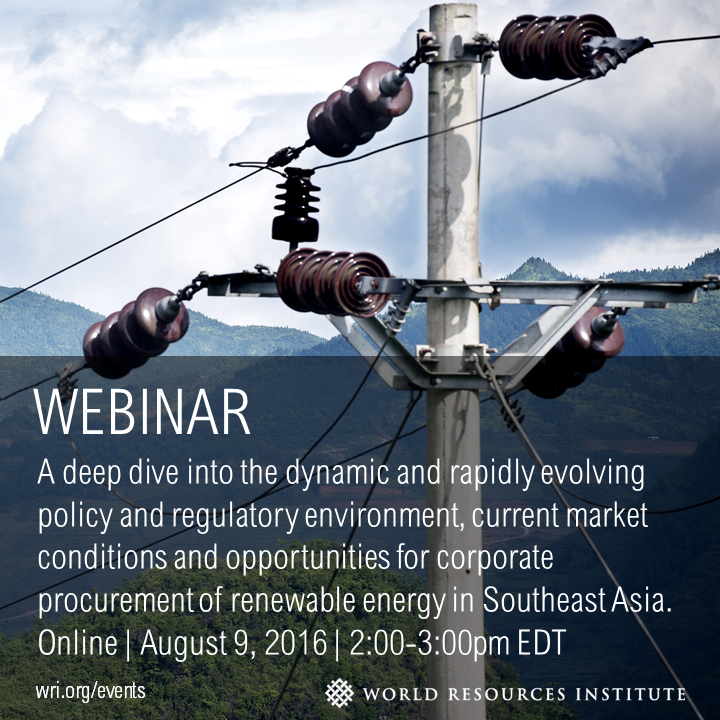 This webinar takes a deep dive into the dynamic and rapidly evolving policy and regulatory environment, current market conditions and opportunities for corporate procurement of renewable energy in Southeast Asia. This region is a powerhouse of global economic growth, manufacturing and, increasingly, greenhouse gas emissions. Governments are grappling with how to implement their commitments under the Paris Agreement while still meeting increasing energy demand. In this webinar, Alexia Kelly, Partner at Allotrope Partners, and Letha Tawney, Director of Utility Innovation at WRI, introduces an innovative public-private partnership, the Nationally Determined Contribution Investment Accelerator (NDCIA), which seeks to dramatically increase deployment of renewable energy in South East Asia and other key emerging markets by 2020. Joining forces to launch the NDCIA are WRI, Allotrope Partners and the National Renewable Energy Laboratory (NREL), with support from the U.S. Agency for International Development (USAID). The webinar is co-hosted by World Resources Institute and Allotrope Partners. Alexia Kelly is a Partner at Allotrope Partners, where she leads the firm’s work on public private partnerships for climate and energy finance in emerging markets. Alexia has worked for more than a decade across the public, private and philanthropic sectors on climate change mitigation strategy, finance and policy. Alexia holds a B.A. in Planning, Public Policy and Management, a Master of Public Policy and a Master of Community and Regional Planning from the University of Oregon. Letha Tawney is the Director of Utility Innovation and Polsky Chair for Renewable Energy at WRI. She leads the strategy in Charge, WRI's Electricity Initiative, to develop new business and regulatory models for utilities in the electricity sector. She focuses particularly on how utilities, regulators, entrepreneurs and customers can adopt more collaborative approaches to buying, regulating and planning for low-carbon energy that reduce costs and increase access. Letha holds a Master’s of Public Administration from the Harvard Kennedy School and a Bachelor’s in Business and Computer Science from George Fox University. She has written and co-authored many publications on accelerating innovation in renewable energy technology and the electricity sector.